Today we have the fifth of six sessions of Chi Gong, a Chinese exercise program conducted by a young Chinese man named Joshua. Its extraordinarily slow and graceful movements are unlike anything I’ve seen before, including Tai Chi or yoga. Joshua’s English is challenging, particularly for hearing-challenged me, and even for all the others in the class. But that doesn’t matter; Joshua demonstrates the moves and is very skillful in gradually building them performance capabilities in the repertoire of moves for the six in the class. I’m struck by two thoughts about Joshua’s Chi Gong: one, the learning by emulation, an incredibly powerful heuristic, and two, how the elements of Chi Gong resemble how I tackle the design of my furniture. Chi Gong relies on balance, range of motion, and graceful control. I start with the control, as I work to achieve function and to incorporate balance and proportion while juggling color, texture, strength, and weight of the antique building materials that define my niche. I want the buyers of these pieces to feel both functional and aesthetic satisfaction. I point to this table for an example. 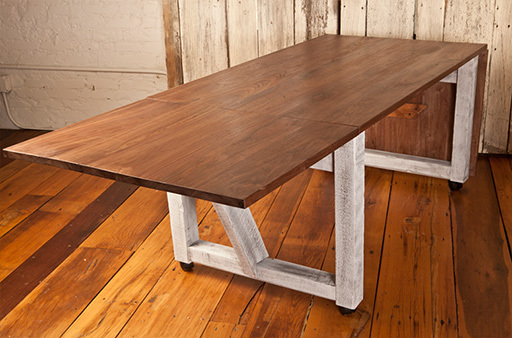 It’s a drop-leaf dining table that leaves down, seats four, leaves up, ten.